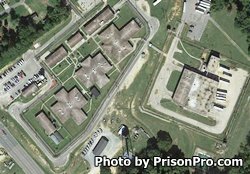 Sampson Correctional Institution is located in Clinton North Carolina. It is a minimum and medium security institution that houses approximately 452 adult males. Offenders are housed in separate dormitories depending on their security classification. Medium inmates are located in a building secured with armed guard towers and armed patrol. Sampson Correctional Institution participate in the Correctional Industries program and allows inmate to earn a wage working in a laundry operation. Up to 125 inmates are allowed to work in the laundry operation, other inmates may work on road crews, or in supportive roles within the institution like preparing food, and performing custodial work. Vocational classes in horticulture, and refrigeration and air conditioning are available to inmates. Additionally, GED prep courses are also available. Visitation times at Sampson Correctional Institution are determined by the first letter of the inmates last name. Visiting occurs on Saturdays in two sessions from 9am-11:30am and from 1pm-3:30pm, and on Sundays in one session from 1pm-3:20pm. Inmates are scheduled for only one of these times, and since the schedule rotates you will need to contact the facility for the current rotation.